There have been several key changes in the global energy landscape in recent years. The surge of U.S. crude production, the reimposition of sanctions on Iran, efforts by OPEC to goose prices, instability in producers like Venezuela and Libya, and rapacious appetites in emerging economies have reconfigured long-established oil flows across the world. Last week, for example, newly released data showed Saudi crude exports to the U.S. Gulf Coast dropping to nearly a fifth of levels a year ago. The week before, Saudi Crown Prince Mohammed bin Salman made high-profile visits to Pakistan, India and China to woo new buyers and investors. There are countless dimensions to the geopolitics of energy security. Price swings can lead to a surge in prosperity and clout in one country while wreaking havoc on the internal politics of another. Countries have routinely proved willing to meddle in the internal politics of oil-rich states to protect commercial energy interests. Territorial disputes become an order of magnitude more explosive when energy riches are at stake. 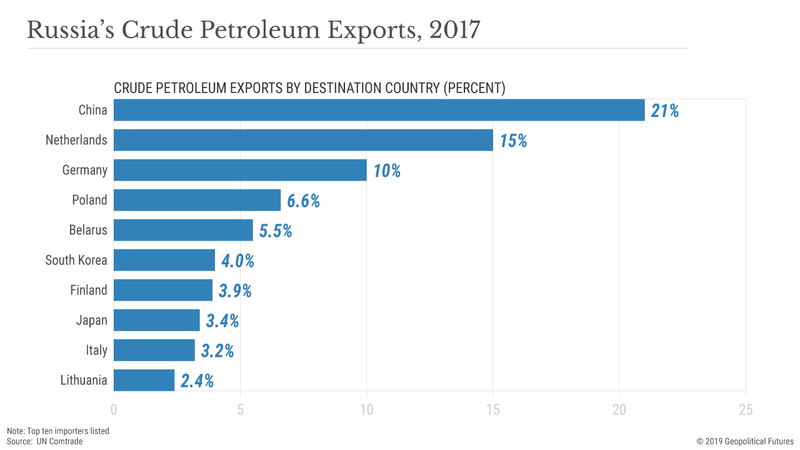 But the geopolitical importance of where an importer gets its crude from, or to which countries a producer sells its oil, tends to be overstated – and often overvalued by policymakers. More often than not, it just doesn’t matter. As a general rule, a barrel of oil is easy to move, easy to blend with barrels from another producer to meet quality requirements, and easy for importers to buy at market prices. It’s a largely fungible commodity sold on a deeply integrated global marketplace. Still, there are exceptions to this rule, in which trade is driven by non-market motives and in which crucial dependencies can take root. And as the current upheaval in oil markets shakes out, it’s the exceptions that are worth watching most closely. Economists often refer to the international oil market as a “global bathtub” – one with many spigots and many drains, but one holding the bulk of the world’s oil supply with broad consistency in value. This is because oil is generally a global commodity. Most crude is cheap to move across a variety of modes of transportation, from ships (responsible for around half of all oil shipments) to trains to pipelines, without having to be substantially altered to accommodate any particular one (unlike, say, natural gas, which must be liquefied before loading on a ship and then regasified after offloading). The ease and low cost of modern ship-born transportation (it can cost less than $2 to move a barrel of oil from the Middle East to the U.S. or East Asia) means any country with a viable port terminal can buy crude from just about anywhere in the world. Prices can sometimes differ slightly from one region to another because of political, geographic and infrastructure factors, and quality can vary. But since various grades can be blended together to meet the processing specifications of a refiner, the spread between most grades is relatively narrow, ensuring that importers typically have ample choice in suppliers at market rates. Ultimately, a barrel of oil from Saudi Arabia usually ends up having comparable value to a barrel from Angola. Fungibility often allows the market to function globally in scale. A useful comparison is natural gas. The commodity cannot be moved around the globe nearly as cheaply or easily as crude, so prices vary considerably more from one regional market to another. This is beginning to change as countries build out infrastructure for LNG. But the liquefaction process and associated infrastructure are still expensive enough – accounting for as much as 30-40 percent of the price of the commodity – to make LNG uncompetitive against compressed natural gas transported via pipeline in most cases. As a result, countries are far more likely to remain dependent on pipelines to meet their natural gas needs – and besides, pipelines themselves are expensive to build, and they are captive to a small number of suppliers (and vice versa). In the past couple decades, natural gas dependencies have taken on greater geopolitical importance than those stemming from crude. For example, Russia’s cutoff of natural gas supplies to Europe via Ukraine at the height of winter in 2006, 2009 and 2014 illustrated how an exporter can leverage natural gas dependencies for strategic gain. Countries are rarely able to weaponize oil in such a manner. Exporters may band together to try to limit supply to affect global prices, as demonstrated with mixed success repeatedly by OPEC. Two countries may operate outside the global market by forging special arrangements that serve narrow commercial or strategic aims. (Around a fifth of global production is not sold on markets.) But in these situations, the global oil market otherwise still functions normally, with most importers still able to ensure stable supplies from various sellers at market rates priced transparently against a handful of benchmarks. Countries can easily avoid long-term dependencies. A major exporter like Saudi Arabia is rarely in a position to exploit its energy relationship with a major buyer like India in service of strategic aims. In other words, Riyadh can’t expect to gain much by threatening to cut off oil supplies if New Delhi doesn’t, say, end its partnership with Iran on the strategically important Chabahar port. It may take some time for India to adjust, and the risk of a short-term economic crunch may be problematic. But any leverage Riyadh has would be fleeting, as India eventually could just boost imports from a combination of Qatar, Nigeria and any number of other suppliers instead. And for all the industry upheaval it has triggered, the shale revolution in the U.S. and elsewhere won’t change this dynamic. The introduction of a new major oil exporter – one that happens to be the world’s largest oil consumer, the protector of global sea lanes and a non-OPEC member, to boot – will only help ensure an environment of plentiful supply and unhindered flows across the global commons. There are several exceptions to the global bathtub where oil buyer-seller relationships are determined by factors beyond supply and demand – and, thus, where it can matter quite a bit geopolitically from where an importer gets its crude or to whom a producer is selling it. In these circumstances, dependencies are most likely to form, and an importing country’s desire for the lowest possible price of crude could take a back seat to its broader strategic interests. This dynamic typically involves landlocked countries that cannot easily draw from the global bathtub, tethering them to suppliers by train or pipeline (or to transit states through which the crude is transported). Belarus is one such example. In 2017, Belarus produced enough oil to meet only around one-fifth of its consumption. It purchased more than 99 percent of its crude imports, valued at $5.23 billion, from Russia but accounted for just 5.5 percent of Russian oil exports that year. There’s a clear dependency here – and one that Russia, which sees Belarus as indispensable to Russian security, has a strategic interest in leveraging. Indeed, the two are locked in a yearslong dispute over plans to remove discounts on Russian oil – re-exports of which account for nearly a third of Belarus’ export revenue – with Moscow occasionally sharply reducing oil flows to the country in an attempt to strongarm Minsk into compliance. The dispute may be motivated, at least in part, by Minsk’s occasional efforts to find some strategic balance between Russia and the West. Regardless, Belarus is in an uncomfortable position. On March 1, Belarusian President Alexander Lukashenko announced that the country was exploring alternative sources of oil, potentially via ports in Ukraine and the Baltics, though Minsk has made several such proclamations in the past. Dependencies can also stem purely from geopolitical isolation. North Korea is the most prominent example. The U.N. sanctions implemented in 2016 have only deepened its near-total oil dependence on China and, to a much lesser extent, Russia. In the unlikely event that China deemed it worth the risk of pushing the North to the brink of collapse, it could impose a blanket embargo on oil exports to the Hermit Kingdom. 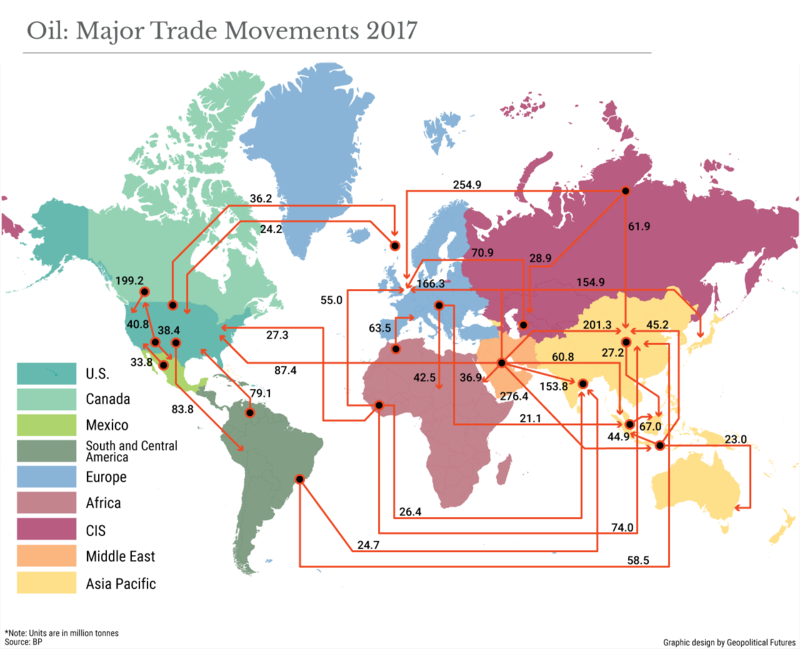 The second exception typically occurs when geographic, economic and geopolitical conditions limit the number of buyers available to an exporter. This often involves situations where a country’s crude cannot be moved to port easily or cheaply, making producers more dependent on markets that can be served by pipelines or, less often, rail. Canada, for example, has to sell nearly all of its oil mined in its central provinces to the United States, creating a growing dependency on its mercurial southern neighbor. Geopolitical factors like sanctions can also restrict producers’ access to the global market and force them into dependencies. The most prominent example here is Iran, which has been forced to court buyers that are willing to buck U.S. pressure since oil sanctions were reimposed in November. Russia, meanwhile, is grappling with both geographic and geopolitical constraints on its oil exports. The bulk of Russia’s vast untapped unconventional reserves are located in eastern Siberia, half a continent away from the closest major port at Kozmino. 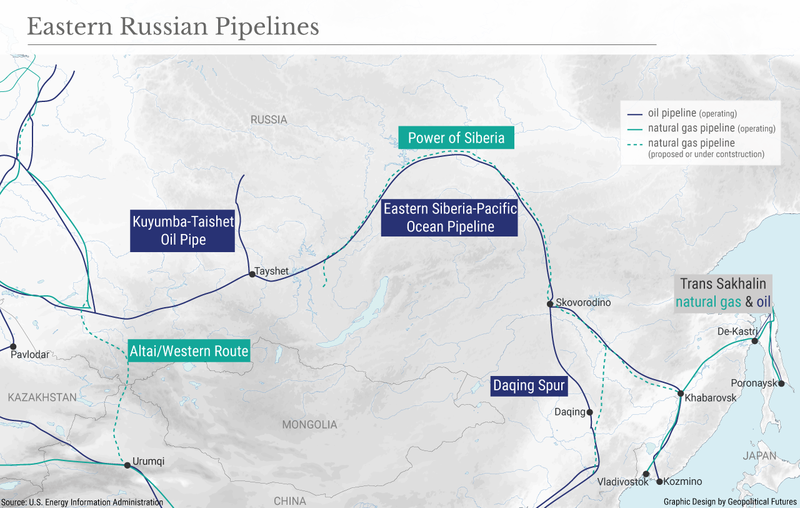 The only realistic way for Russia to get the crude to market has been by building the 3,000-mile (4,800-kilometer) Eastern Siberia–Pacific Ocean pipeline, work on which began in 2005. Theoretically, the pipeline enables Russia to dump its crude into the global bathtub. And as recently as 2011, 75 percent of the pipeline’s crude went to Japan, South Korea and the U.S. But in an era of low oil prices, considering the high cost of building and maintaining the pipeline, it has made economic sense to send more than 90 percent of the ESPO crude to the closest major consumer market: China. In 2017, 21 percent of Russian crude went to China. Last year, Russian exports to China increased another 19 percent. New cross-border pipeline spurs are expected to cement China’s position as the primary consumer of ESPO crude for the foreseeable future. Geopolitical factors have contributed to Russia’s eastward turn as well. As Russia reasserted itself in Eastern Europe over the past decade, it had to contend with the possibility that Western sanctions would sever its access to key markets – particularly Europe, which historically has been Russia’s primary buyer. As a result, even before global oil prices collapsed in 2014, Moscow had been increasingly looking east for buyers. In 2013, for example, Moscow locked itself into a 25-year supply agreement with China. China needs a lot of oil and has a strategic interest in reducing its vulnerability to a potential maritime blockade that would leave it starved for energy. But for the time being, Russia will need Chinese buyers more than China will need Russian crude, creating a modest Russian dependency on Beijing. Russia understands as much and so has explored ways around it, including the pioneering of shipping routes through the Arctic and its renewed, albeit cautious, efforts to settle a World War II-era territorial dispute with Japan. The third exception typically involves producers whose particular grade of crude can’t easily be blended with everything else sloshing around in the global bathtub. Examples of problematic grades include heavy (high viscosity), sour (containing high sulfur content and other impurities) crude, often produced from oil sands. Before being blended with other crudes, the heaviest, most sour grades must be refined at specialized facilities that are in short supply, limiting the availability of buyers. The obvious example here is Venezuela, home to the world’s largest technically recoverable oil reserves, much of which is of poor quality. Refineries capable of handling this type of oil are few and far between. Thus, despite being on strained terms with the U.S., to say the least, for the better part of two decades, most Venezuelan crude has continued to flow to the U.S., though it has dropped to just below 50 percent from more than 70 percent in the 1990s. In 2017, its only other major buyers were India and China. The vulnerability created by this dependency has been made abundantly clear with the recent imposition of U.S. sanctions, as well as with U.S. efforts to redirect revenue from the Venezuelan-owned Citgo (which Caracas has used to get a cut of downstream profits) to the Venezuelan opposition. Occasionally, the availability of sellers for certain importers can likewise be limited by demands for specific types of crude. South Korea’s petrochemical industry, for example, relies almost entirely on condensate – a form of ultra-light crude that’s derived as a byproduct from natural gas production – from the massive South Pars field, which is shared by Iran and Qatar. Seoul has said it will eventually comply with U.S. sanctions on Iran. But South Korean importers have reportedly struggled to find affordable alternatives and will have to pay hundreds of millions of dollars to overhaul their refineries to handle new sources – something they are reluctant to do given that sanctions on Iran could ostensibly be lifted in the near future if a new nuclear deal is reached or the next U.S. president strikes a new course with Tehran. Underpinning the theory of the global bathtub is the assumption of certain conditions that, while present today, are by no means guaranteed to be permanent. Most important, it assumes the absence of a great power conflict that would threaten to cut off sea lanes, put a premium on short supply lines, and potentially carve the world into competing blocs with major strategic interests in denying each other the oil needed to fuel their war machines. Historically, major importers have acted as though such a conflict was a possibility. During the Cold War, for example, part of what drove the U.S. involvement in the Middle East was the need the keep reliable sources of oil within reach – and out of communist hands – in case a major war broke out with the Soviet Union. We’re still seeing this sort of behavior today, even though the threat of a major war erupting is low. As mentioned, China’s willingness to lock itself into a long-term supply agreement with Russia stems, in part, from its concern about the ability of the U.S. and its allies to cut off China-bound oil traveling through the Malacca Strait or the first island chain. This is also a driver of certain Belt and Road Initiative projects such as a major pipeline to the Indian Ocean through Myanmar, and Chinese pipelines to Central Asia. 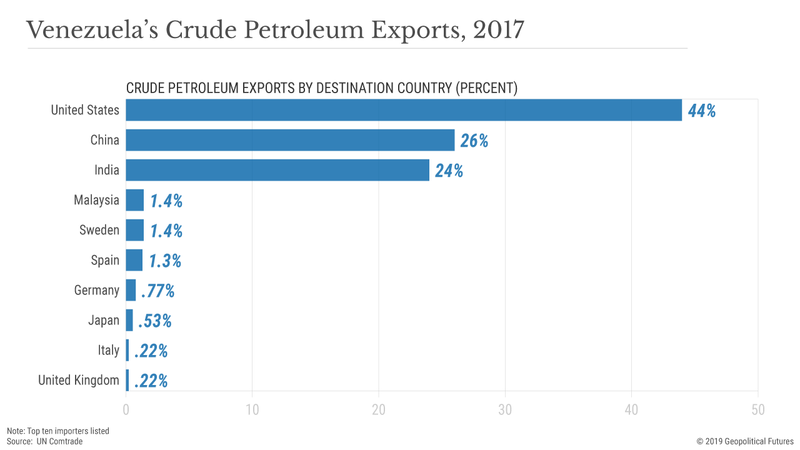 Still, even despite the surge in oil bought from Russia, more than 80 percent of China’s oil imports travel through these chokepoints and the easily blocked Myanmar pipeline. If China has a growing dependency, it’s not on Russia but on free and open maritime trade. Accordingly, the more important geopolitical development is the buildup of Chinese maritime forces aimed at deterring a potential blockade. Similarly, Japan’s overwhelming dependence on maritime trade for its energy needs, and its concern about China’s creeping dominance of its littoral waters, is compelling Tokyo’s own naval buildup. It’s not all that important to Japan where its oil comes from – just that sea lanes remain open. In other words, for energy-hungry powers such as these, the focus is less about preparing for the possibility that the global oil market ceases to function and more about preventing a doomsday scenario from emerging in the first place. "What Surprises Me Is the Extent of the Mess"
Ivan Rogers, 58, was the UK ambassador to the EU for three years before resigning on Jan. 3, 2017. He stepped down after the revealing of an internal memo, in which he was sharply critical of the British government and forecast significant problems for the Brexit negotiations. His book, "9 Lessons in Brexit," appeared in early February. Ivan Rogers: I knew that it would be a long, tortuous and potentially conflictual process. That doesn't surprise me. What does surprise me is the extent of the mess and the fact that four weeks before the deadline, the political class is unable to come to any serious conclusion about what kind of Brexit they want. Of course, Brexit is a revolutionary moment, but I have never seena political crisis like this in my professional career. DER SPIEGEL: Prime Minister Theresa May this week cleared the way for a Brexit delay. Is a no-deal scenario off the table for now? Rogers: It would be a mistake to conclude that. I think there is a serious possibility that we are still paralyzed after March, with no resolution. There will then be a risk that we end up with a no-deal exit in June or July. I don't think there is an appetite in lots of European capitals to simply roll forward extensions while we are still working out where to go. DER SPIEGEL: Is the British political system broken? Rogers: It's not in a healthy state. These are tumultuous times, and I think the political elite has fractured in both parties. You could argue, if you're supremely optimistic, that it's a testimony of the strength of the British system that it still exists and functions in a fashion despite the extent of turmoil we've gone through. The British system can cope with a lot. DER SPIEGEL: Former Labour and Tory parliamentarians have formed the Independent Group in parliament. Can they play a role similar to the En Marche movement in France? Rogers: It's far too early to judge. It's an attempt to reoccupy the center ground at a very interesting moment. I worked for Tony Blair and David Cameron, who were the dominant figures in British politics in the last 25 years. Both were centrist figures and deliberately occupied the center ground. That became the tradition of British politics: Unless you occupy the center, you are finished. After the financial crisis and a period of austerity, the center here has since largely collapsed, and the public is deeply alienated from both big parties. In both parties, populists on the left and the right have gained a much bigger influence. At the moment, we don't have serious, established center-left or center-right figures who command public confidence. DER SPIEGEL: Would a different prime minister have done better than Theresa May? Rogers: They would have had different priorities. Immigration and the free movement of people is the central question for Theresa May. She wants to reduce the numbers of people coming into the UK both from inside and outside the EU. The consequence was always obvious: Once you end that, you can't have free movement of goods, services and capital. So you have to leave the single market. And if you want a fully autonomous trade policy, you cannot stay in the customs union either. DER SPIEGEL: The Europeans didn't expect that. Rogers: They found that quite shocking. The way Theresa May prioritized that very early on indicated to the Europeans that we would be going much further out of the European Union than Norway and Switzerland, or even Turkey, which has a customs union agreement with the EU. In all honesty, I don't think she fully understood what a dramatic rupture that would have been. Since then, she has tried to edge things back. But her problem is: Having started with a hardline position, every time she's moved a little bit back, the right wing of her party cries betrayal. I think other prime ministers could have done it in a different fashion. DER SPIEGEL: May is not the only British politician who doesn't totally understand the European Union. Rogers: This is an endemic problem. I am one of the few who has worked for the bulk of my career on European issues. British politicians don't understand what the single market or the customs union is or how the EU really works. This is a problem in many member states, but it is worse here. I have worked with several prime ministers very closely. Although all of them have been very able people, none of them have had a deep understanding how the European Union works. They don't have an emotional attachment to the EU, because we've always had a rather mercantile relationship with our neighbors. DER SPIEGEL: What is your view of the role the EU has played in the negotiations. Do you think they trying to "punish" the UK as many Brexiteers claim? Rogers: I don't. If you deliberately leave the club, it has automatic consequences, and some of them are unpleasant. Of course there is a risk: For the British public, who has no reason to understand every detail, it looks as if the Europeans have set up a process to maximize the British pain. I don't think they have. DER SPIEGEL: Have the Europeans done everything right? Rogers: They have set up a very well-structured technocratic process which delivers legal text. But I think that European leaders spent too little time thinking about how the future of the continent should look after Brexit. That is a mistake. DER SPIEGEL: What should it look like? Rogers: My argument would be that there is still an awful lot of common ground and common values. It's not that the relationship between Britain and France or Germany is bad. But I have never seen a thinner relationship in my lifetime. There is an awful lot going wrong in the world at the moment. But I don't think the European political elites are talking to each other anything like as much as they did 20 years ago. DER SPIEGEL: Whose fault is that? Rogers: Overwhelmingly, the Brits have to take the responsibility for this, because it's the British political class who increasingly lost interest in Europe. But let's assume Brexit happens and we remain out for the foreseeable future: Europe will then have 65 million people 20 miles offshore, theirbiggest single trading partner on this side of the planet and your biggest security partner. And this at a time when you've got trouble to the east and trouble to the south. The British role in this can be important. The German political elites have to think hard: How are we going to work together? Rogers: Otherwise, you will see the divergence that has already started getting worse and Britain increasingly concluding that it has nothing to do with you and drifting to the other side of the Atlantic, which geographically we can't, but mentally we can. It would be tragic if Britain were to turn its back on the continent. DER SPIEGEL: Unfortunately, the political declaration regarding the future relationship is rather vague and opaque. When it comes to the second stage of the negotiations, which are to lay the groundwork for a free-trade agreement, will we see the same chaos all over again? Rogers: I think so. It's opaque because the British wanted it opaque. We don't really know where we want to go. Therefore, the other side has agreed to a document which is full of ambiguity. That's very clever, but it doesn't solve any problems. The Europeans are saying: Until you tell us something more coherent and intelligent about where you want to go, we can't really have a debate with you. I understand that. But I don't think that's good enough. I think the Europeans also need to tell us what kind of relationship they want. Just sitting back and watching until London has sorted out its chaos is an understandable reflex. But it's not the right one. DER SPIEGEL: How long will it take to sort out the future relationship? Rogers: Much longer than many people think. The planned trade deal is not "the easiest in human history," as Liam Fox has claimed. It's not easy to solve for one simple reason: This is the first trade deal in history where partners are seeking to get further apart. All trade deals I've ever worked on were about getting closer together and dismantling barriers to trade. We are now deliberately re-erecting barriers, seeking a thinner relationship than the one we have. We like the free trade with Europe, but not the European institutions. Well, that's not on offer. That's why the next step of the negotiations will be conflictual again. The Europeans will say: There must be a reason why you wanted to leave and diverge from our model, please tell us what degree of divergency you want and why. You only need to say it that way to realize that this will not take months, but years. DER SPIEGEL: There are some in London who would like you to come back to help sort out the mess. Is that something you would consider? Rogers: I didn't resign because I refused to deliver Brexit. I said to my staff on the morning of the referendum: If you can't work for a government that is committed to delivering Brexit, don't work here. My heart was always behind giving the country what it had decided and delivering the best possible Brexit. I am happy to do anything I can to contribute to getting my country to the right place in the next 10 or 20 years. But it's a totally hypothetical question. Nobody in government will ask me to get back into the political circus any time soon.